This was a hard film to watch. 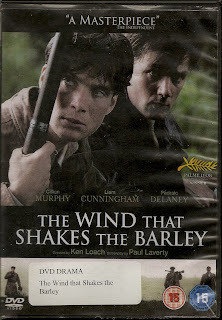 Taking place in Ireland at the time of the "troubles" in 1920, the film takes a hard and uncomfortable look at the violence and hatred, on both sides, in a struggle that would last for another 80 years. To this day there are still issues that threaten the peace. I could delve into the history of the conflict, but that would take days. And in the end my conclusion of whom is right, or wrong, would make no difference. So, I will confine myself to the movie. Filmed in Ireland, in the towns Ballyvorney, Bandon, Coolea and Timoleague, all in County Cork, places the action right where it happened, lending a reality to the film that could never be achieved in a studio. The early morning fogs, the damp weather, all serve to make the viewer uncomfortable, which is just what Director Ken Loach had in mind when he made this film. This is not "A Quiet Man." Damien O'Donovan, played by Cillian Murphy, is a young doctor on his way to London and a job in a hospital there. His brother, Ted, played by Padraic Delaney, is a leader in the local IRA militia. The two brothers are on opposite sides of the fence about the British occupation. While Damien feels that there is nothing to be done, save submit, his brother Teddy is busy organizing, and fighting, for Independence. After a hurling match the brothers return home, only to be rousted by the British Black and Tans, who beat his friend Michael to death after he refuses a strip search. Still determined to leave Ireland he prepares to board the train to London. But an incident at the station, where the engineer refuses to transport the British soldiers, resulting in a brutal beating of the train's elderly conductor, changes his mind. He returns home and joins his brother in the fight for Independence. Staging raids on the local British arsenal gains them a supply of arms, and the wrath of the British, as they search, house by house, for the culprits. When they find no men at home, they burn the houses down. When the women won't answer questions, they are beaten, and their hair is shorn and ripped from their heads. After being captured themselves, the brothers are tortured, just as the Anglo-Irish Treaty is about to be signed. This treaty would only make Ireland a Domain of Great Britian. As the Irish Free State becomes the law of the land, some of the old militia, including Teddy, join up with the new, British backed, Irish Army. This only infuriates Damien. After all, he gave up his career to bring forth a free Republic, not a vassal state of the British. At this point Damien begins his own war against the new Irish Army, directly fighting against his brother. When he is captured in a raid and sentenced to the firing squad, Teddy pleads with him to reveal the names and locations of the IRA members and their weapons caches. Damien, who never wanted to be in this struggle to begin with, refuses. He writes a farewell letter to his lover, Sinead, played by Orla Fitzgerald, stating his undying love for her and letting her know that he faces death unafraid. He is then placed in front of the firing squad, and Teddy, fighting back tears, gives the order to fire, killing his own brother. When Teddy informs Sinead of Damiens death she physically attacks him, and bans him from her life forever, underscoring the deep divisions that the "struggles" have caused. At 121 minutes, the film can feel a bit long, but the acting and direction carry the day, as the viewer is compelled to see how this all ends. And when it does, you are find yourself painfully aware of the fact that this struggle continued for another 80 years, tearing families apart. A stunning portait of a very dark era in the history of both England and Ireland, Ken Loach has given us a truly realistic and disturbing picture of the darker side of human nature.